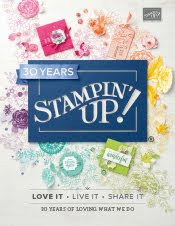 As a demonstrator, I receive a monthly Stampin' Up! newsletter. When I got my November one the other day in the mail, I was super excited to see a bunch of Christmas card ideas on the cover! So, this card is inspired by one that I saw there. I loved the clean look of it, with all the white layers. I used the set Peaceful Season, which is a hostess only set during the Holiday Mini Catalog period. I actually got the set as a gift at Convention - Sweet, huh?? Also, the little added scallopie things on the bottom edge are from the new Tasteful Trim Big Shot XL die. I wasn't sure I wanted that die at first, thinking it was more for sewing stuff, but I love it for borders on cards - Awesome! And, yes I did cut out the leaf and berry image! ...with paper snips! :) At class, this is always our "what?? no punch for the image??" So, anyway, it was worth the cutting, cuz I like it! And... I even embossed the saying in silver - haven't embossed a lot lately, but it always gives that added something!